We are manufacturers of high quality Perforated Cable Trays with uniform holes that are suitable for cables that require both a degree of protection from external damages and ventilation. 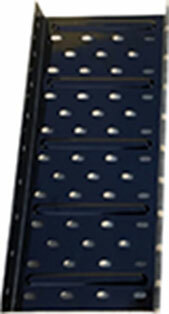 Our Cable Trays undergo high quality surface treatment to make them corrosion resistant and highly durable. We offer these in various standard sizes and are also custom made as per the specifications of our customers. Our Cable Trays are available in various constructions â€“ Mild Steel | Galvanized Steel | Stainless Steel.